Leading Custom MEMS Manufacturer closes 2011 with four Profitable Quarters, enlarged customer base, and very positive 2012 outlook. Peter Pfluger, CEO of Tronics, commented: “This is by far the most exciting time for the company since its inception in 1997. Tronics is growing strongly again. After an uninspiring 2009 and 2010, business started picking up in late 2010, and remained very healthy throughout 2011. The company secured important new foundry and custom MEMS contracts during the year and its revenues grew significantly in its three key regions: Europe, the USA, and China. With a strong balance sheet that includes more than 3 million Euros cash and a debt/equity ratio below 30 percent, Tronics is well positioned to continue its expansion in 2012 and beyond. A 20-30% growth is expected in 2012 with further improvement of the Company’s profitability. A very substantial portion of the 2012 revenues is already firmly secured. During the downturn, Tronics was able to broaden its customer base in two key areas: one is Tronics historical core business of advanced MEMS for harsh environments, the other one is the more traditional MEMS foundry business, where Tronics’ was able to win new projects in a variety of applications such as consumer, bioMEMS, optical and industrial. With fabs in Grenoble and Dallas, and partnerships being put in place for projects requiring 8’’ wafers, Tronics offers what is probably the most flexible and versatile process portfolio, to customers worldwide. In parallel, and without any need for fresh financial injections, Tronics has developed two inertial product platforms; a high performance gyrometer platform, and a 3 axis accelerometer platform. Customers worldwide are reacting positively to this offering that reduces their risks and time to market. With its existing contracts, Tronics’ has the potential to triple its revenues over the next 3 to 5 years. A significant part of this growth will come from its US branch in Dallas, and from demand in China and other Asian countries. The current customer portfolio is quite diverse and resistant to volatility of specific markets. Tronics is an international, full-service MEMS manufacturer. With wafer fabs in France and the USA, and representation in Asia, Tronics provides local support to customers on three continents, and offers one of the broadest technology portfolios in the industry. 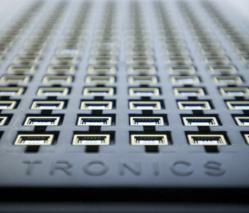 Tronics’ services range from MEMS design, to high-volume MEMS manufacturing. The company builds reliable supply chains for delivery of MEMS ranging from wafers to integrated custom components, but also supports earlier phases of projects where prototyping is required. Founded in 1997, Tronics has 15 years of experience in developing, manufacturing, and packaging accelerometers, gyroscopes, micro-pumps, pressure sensors, switches, bio-detectors and many more MEMS. Visit http://www.tronicsgroup.com for more information.